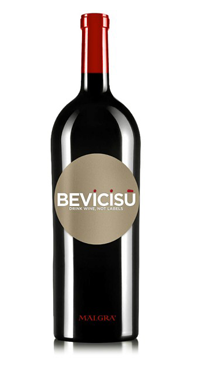 In Italian, BEVICISU is a saying that evokes sitting down with friends and sharing meals and conversation. Malgra bottles their Barbera only in large format; the “Pintun” Piedmontese; the perfect bottle for family dinners and group gatherings. The Barbera grape grows in the lower slopes and valleys of Piedmont, north western Italy. It is often considered inferior to another red grape of the region, Nebbiolo, the noble variety of Barolo and Barbaresco. However, Barbera deserves more attention, as it is always more approachable (ready to drink) and cheaper than any Nebbiolo. It is really a wine “for the people”; fruity, fresh and bright tasting. This version has heaps of dried cherry and plums along with herbs like anise, the tannins are low and the acidity is medium-high making it very easy to drink and an excellent dinner companion.